With over 30 years of experience as a luthier and repair person, Martyn Booth knows a thing or two about electric guitar design. A member of Gibson’s repair and service team in the 1970s and product manager and designer for Yamaha in the 1980s, he began hand crafting guitars under his own name in 2002. “We like to deal with customers and dealers on a personal basis and we won’t compromise on quality,” says Martyn. “Order one of our guitars and you will have the opportunity to select the timber of your choice, tailor the neck dimensions and fretwire to suit your playing style and specify the pickups, hardware and finish that you prefer. We want our guitars to provide the ultimate in performance and playability.” Need we say more? 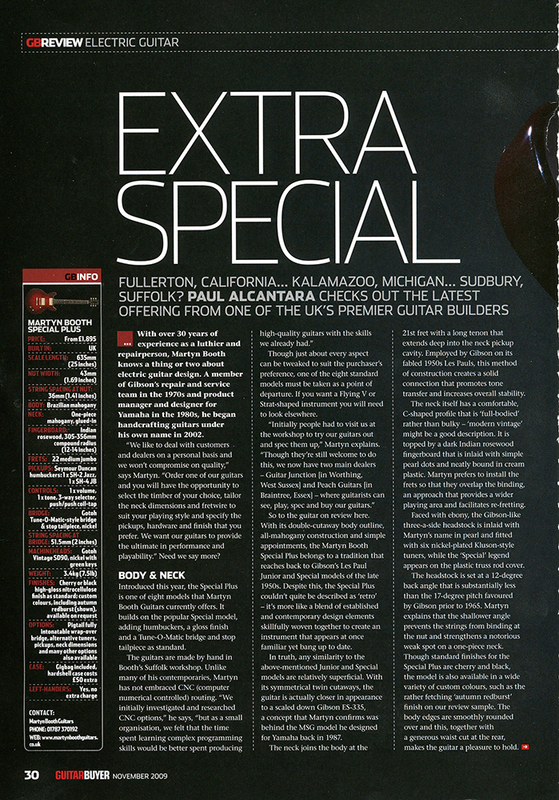 Introduced this year, the Special Plus is one of eight models that Martyn Booth Guitars currently offers. It builds on the popular Special model, adding humbuckers, a gloss finish and a Tune-O-Matic bridge and stop tailpiece as standard . Though just about every aspect can be tweaked to suit the purchaser’s preference, one of the eight standard models must be taken as a point of departure. If you want a Flying V or Strat-shaped instrument you will need to look elsewhere . 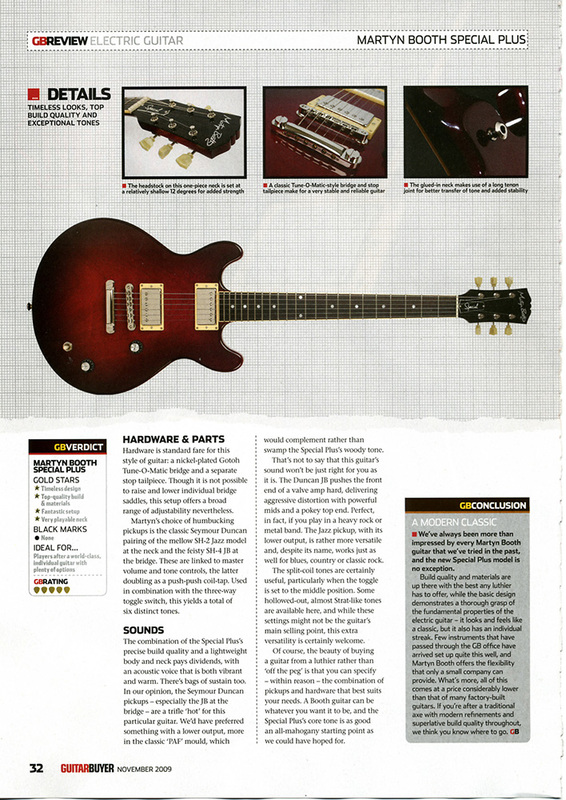 So to the guitar on review here. With its double-cutaway body outline, all-mahogany construction and simple appointments, the Martyn Booth Special Plus belongs to a tradition that reaches back to Gibson’s Les Paul Junior and Special models of the late 1950s. Despite this, the Special Plus couldn’t quite be described as ‘retro’ – it’s more like a blend of established and contemporary design elements skillfully woven together to create an instrument that appears at once familiar yet bang up to date. In truth, any similarity to the above-mentioned Junior and Special models are relatively superficial. With its symmetrical twin cutaways, the guitar is actually closer in appearance to a scaled down Gibson ES-335, a concept that Martyn confirms was behind the MSG model he designed for Yamaha back in 1987. The neck joins the body at the 21st fret with a long tenon that extends deep into the neck pickup cavity. Employed by Gibson on its fabled 1950s Les Pauls, this method of construction creates a solid connection that promotes tone transfer and increases overall stability. The neck itself has a comfortable, C-shaped profile that is ‘full -bodied’ rather than bulky – ‘modern vintage’ might be a good description. It is topped by a dark Indian rosewood fingerboard that is inlaid with simple pearl dots and neatly bound in cream plastic. Martyn prefers to install the frets so that they overlap the binding, an approach that provides a wider playing area and facilitates re-fretting. Faced with ebony, the Gibson-like three-a-side headstock is inlaid with Martyn’s name in pearl and fitted with six nickel-plated Kluson-style tuners, while the ‘Special’ legend appears on the plastic truss rod cover. The headstock is set at a 12-degree back angle that is substantially less than the 17-degree pitch favoured by Gibson prior to 1965. Martyn explains that the shallower angle prevents the strings from binding at the nut and strengthens a notorious weak spot on a one-piece neck. Though standard finishes for the Special Plus are cherry and black, the model is also available in a wide variety of custom colours, such as the rather fetching ‘autumn redburst’ finish on our review sample . The body edges are smoothly rounded over and this, together with a generous waist cut at the rear, makes the guitar a pleasure to hold . 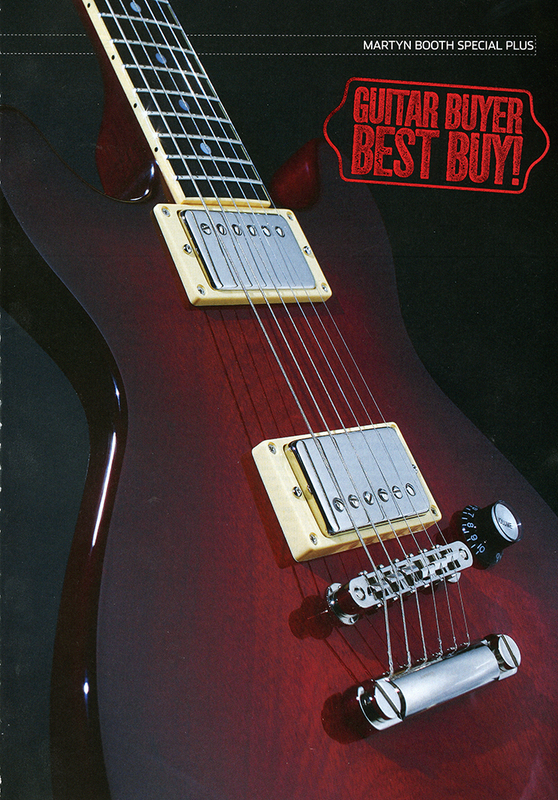 Hardware is standard fare for this style of guitar: a nickel-plated Gotoh Tune-o-Matic bridge and a separate stop tailpiece. Though it is not possible to raise and lower individual bridge saddles, this setup offers a broad range of adjustability nevertheless. Martyn’s choice of humbucking pickups is the classic Seymour Duncan pairing of the mellow SH-2 Jazz model at the neck and the feisty SH-4 JB at the bridge. These are linked to master volume and tone controls, the latter doubling as a push-push coil-tap. Used in combination with the three-way toggle switch, this yields a total of six distinct tones. The combination of the Special Plus’s precise build quality and a lightweight body and neck pays dividends, with an acoustic voice that is both vibrant and warm . There’s bags of sustain too. In our opinion, the Seymour Duncan pickups – especially the JB at the bridge – are a trifle ‘hot’ for this particular guitar. We’d have preferred something with a lower output, more in the classic ‘PAF’ mould, which would complement rather than swamp the Special Pius’s woody tone. That’s not to say that this guitar ‘s sound won’t be just right for you as it is. The Duncan JB pushes the front end of a valve amp hard, delivering aggressive distortion with powerful mids and a pokey top end. Perfect, in fact, if you play in a heavy rock or metal band. The Jazz pickup, with its lower output, is rather more versatile and, despite its name, works just as well for blues, country or classic rock. The split-coil tones are certainly useful, particularly when the toggle is set to the middle position . Some hollowed-out, almost Strat-like tones are available here, and while these settings might not be the guitar’s main selling point, this extra versatility is certainly welcome. Of course, the beauty of buying a guitar from a luthier rather than ‘off the peg’ is that you can specify – within reason – the combination of pickups and hardware that best suits your needs. A Booth guitar can be whatever you want it to be, and the SpeciaI Pius’s core tone is as good an all-mahogany starting point as we could have hoped for. We’ve always been more than impressed by every Martyn Booth guitar that we’ve tried in the past, and the new Special Plus model is no exception. Build quality and materials are up there with the best any luthier has to offer, while the basic design demonstrates a thorough grasp of the fundamental properties of the electric guitar – it looks and feels like a classic, but it also has an individual streak. Few instruments that have passed through the GB office have arrived set up quite this well, and Martyn Booth offers the flexibility that only a small company can provide. What’s more, all of this comes at a price considerably lower than that of many factory-built guitars. If you’re after a traditional axe with modern refinements and superlative build quality throughout. we think you know where to go.